His only request to his Christian brothers & sisters in Rome before his impending martyrdom for his faith was simple: don't stop them. 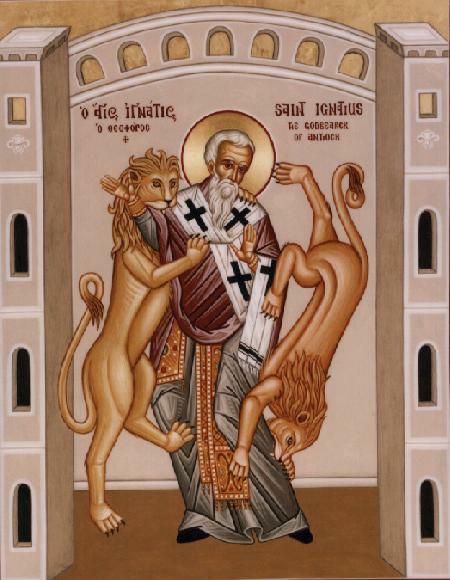 Believing his death to be the ultimate witness of his faith, Ignatius of Antioch (the same Antioch where believers were first called "Christians" less than a century before in Acts 11:26), would rather die for Jesus than rule over the whole world (Matthew 16:26). I'll never again have an opportunity like this to reach God. Nor will you Romans ever again have such a chance to be credited with a finer accomplishment - provided you remain silent. For if you quietly refrain from interfering with me, I will become a crystal-clear message from God. But if you love my earthly body too much, I'll only be an incomprehensible noise. I ask you to grant me nothing but this: that my blood should be poured out as an offering to God while I still have an altar available to me. In your love, you can become the accompanying choir for my sacrifice. Was he scared of dying? Probably. Scared of death? Not at all. Hear some of his last words as he anticipates the wild animals who will be the cause of his cruel death. It's as if he's taunting them. Bring it on! I write to the Churches, and impress on them all, that I shall willingly die for God, unless ye hinder me. I beseech of you not to show an unseasonable good-will towards me. Suffer me to become food for the wild beasts, through whose instrumentality it will be granted me to attain to God. I am the wheat of God, and let me be ground by the teeth of the wild beasts, that I may be found the pure bread of Christ. Rather entice the wild beasts, that they may become my tomb, and may leave nothing of my body; so that when I have fallen asleep [in death], I may be no trouble to any one. Then shall I truly be a disciple of Christ, when the world shall not see so much as my body. Entreat Christ for me, that by these instruments[i.e., by the teeth of the wild beasts] I may be found a sacrifice [to God]. Bring on the fire, bring on the cross, bring on the hordes of wild animals! Let them wrench my bones out of socket and mangle my limbs and grind up my whole body! Bring on all the hideous tortures from the Devil! Just let me get to Jesus Christ. Nothing on this wide earth matters to me anymore. The kingdoms of this world are entirely meaningless. I am at the point where I would rather die for Jesus Christ than rule over the whole earth. He alone is the one I seek - the one who died for us! It is Jesus that I long for - the one who for our sake rose again from the dead! See also, The Epistle of Ignatius to the Romans at Christian Classics Ethereal Library.